As Super Bowl Sunday was approaching I began planning our menu. Super Bowl Sunday is one of the biggest eating events of the year. Wings, queso, guacamole, pigs-in-the-blanket, the delicious food choices go on and on. I was planning a traditional big game menu for our family viewing party. As the game approached it became clear this year it would be a quitet game watching party, consisting of just my husband and I. Furthermore, my husband had dental surgery on Friday before the game. Although the surgery went well and his recovery was easy for him the instructions from the surgeon was no solid food for 3 days. (Que car screeching to a hault!) Ok, scrap all Super Bowl food plans and go to plan b. Thanks to Parker Sanpei and Claiborne and Churchill for sending me media samples I had already chosen a wine to pair with the big game so I only had to rework the meal to pair with the wine and my husband’s post-surgical mouth. 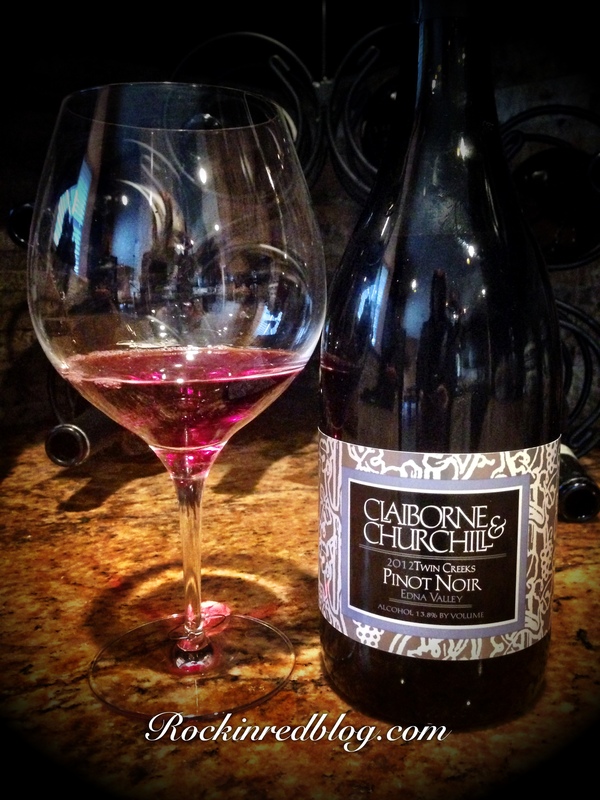 Claiborne and Churchill Twin Creeks Pinot Noir 2012: This wine poured a dazzling ruby with orange and violet highlights into the glass and opened with inviting aromas of concentrated ripe red and blue berries, rose petals with spice notes and cassis. On the palate this Pinot Noir was delicate yet lively and smooth. It was well structured and offered flavors of red cherries, raspberries, strawberries and blueberries with hints of cola, spice and licorice, ending with a pleasing minerality finish. It offered round acidity, refined tannins and a lingering dry finish. This wine was drinking very well and will only get better over time with proper ageing. I recommend this wine! This Pinot Noir was crafted from three clones: 40% 2A (Swiss clone, cherry, raspberry, rose petals, medium body and tannins), 20% 113 (Dijon clone, plum, cherry, raspberry, cedar, medium body, firm tannins), and 40% Martini (UC-Davis clone, AKA #13, strawberry, rhubarb, spice, delicate oak). I could smell and taste the contributions of these three clones elegantly married to create the vibrant yet elegant Twin Creek 2012 Pinot Noir. Claiborne and Churchill limits production of this high quality wine and it is primarily sold to members of their cellar club or in their tasting room. Road Trip! This wine was crafted from a collection of small vineyards on and around Twin Creeks Way, located down the road from the Claiborne and Churchill winery. The clonal selection along with the special soil of the Twin Creeks Vineyard create a bold, balanced wine. This is a great wine in which to purchase several bottles to age and open over time and to share with friends. Alcohol 13.8%. SRP $42. 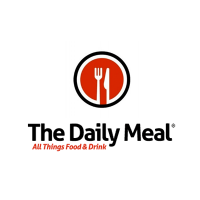 Click here to purchase this wine direct. As I mentioned above my original meal had to be substituted for a post-surgical mouth meal; this ultimately was a blessing because we saved a TON of calories and still had a delicious dinner! 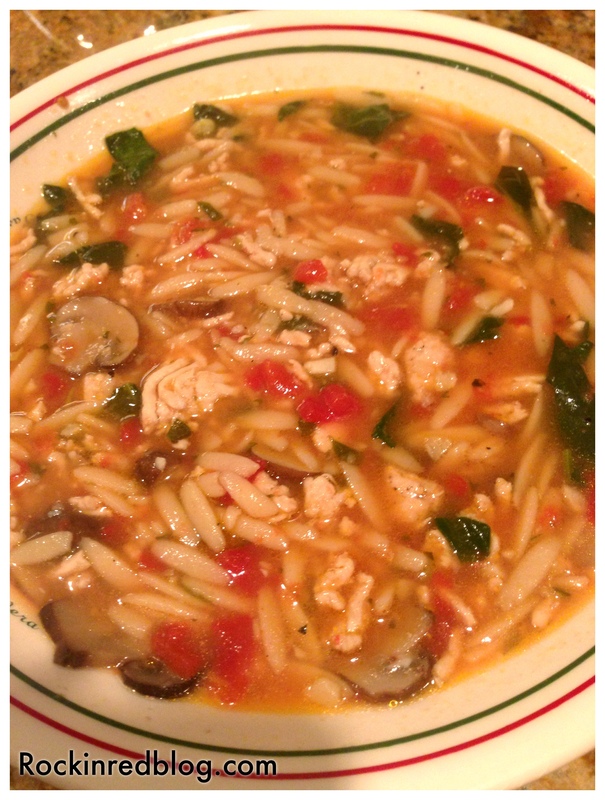 I decided to make a soup from Cooking Light’s January/February 2015 edition, Italian Turkey and Orzo Soup + Roasted Grape and Feta Salad. The soup was easy, delicious and a lovely pairing with the wine. The soup was loaded with savory flavors and the Pinot Noir accentuated them beautifully. 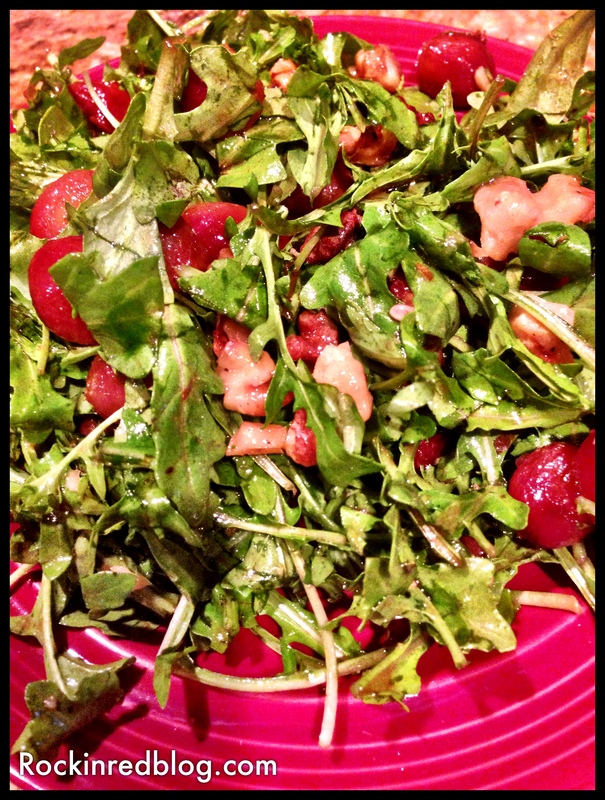 Additionally, the salad included roasted grapes (new to me) which were zesty and really brought out the spice of the wine while blending beautifully with the wine’s concentrated fruit. Finally, for dessert I bought a Sticky Toffee Pudding cake from Whole Foods. 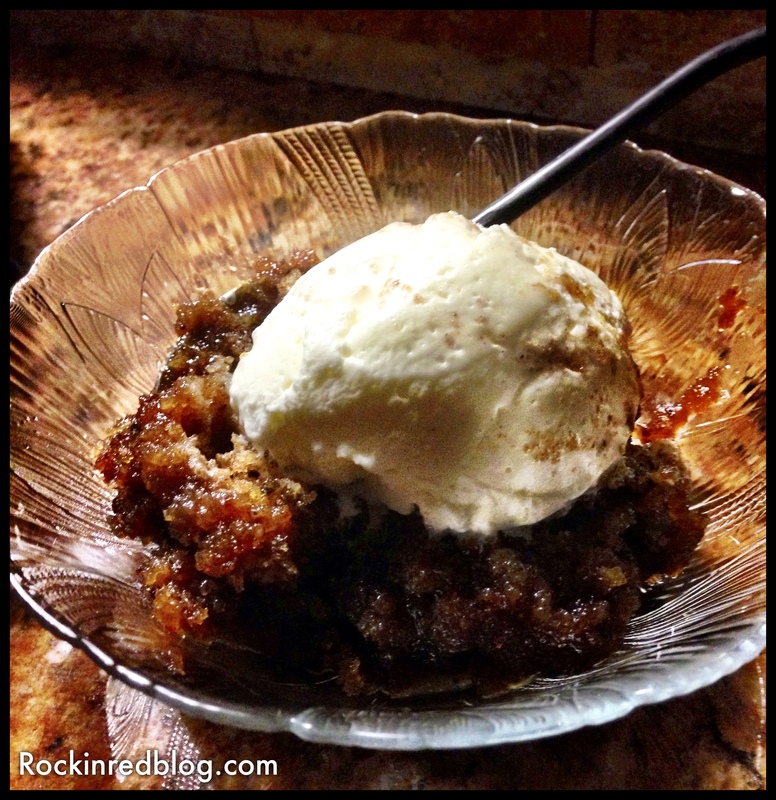 The cake was hand made by the Sticky Toffee Pudding Company in Austin, TX. It was a rich and saucy English pubbing warmed with a toffee topping and topped with fresh whipped cream. The toffee really elevated a smoky, cedar quality in the wine. 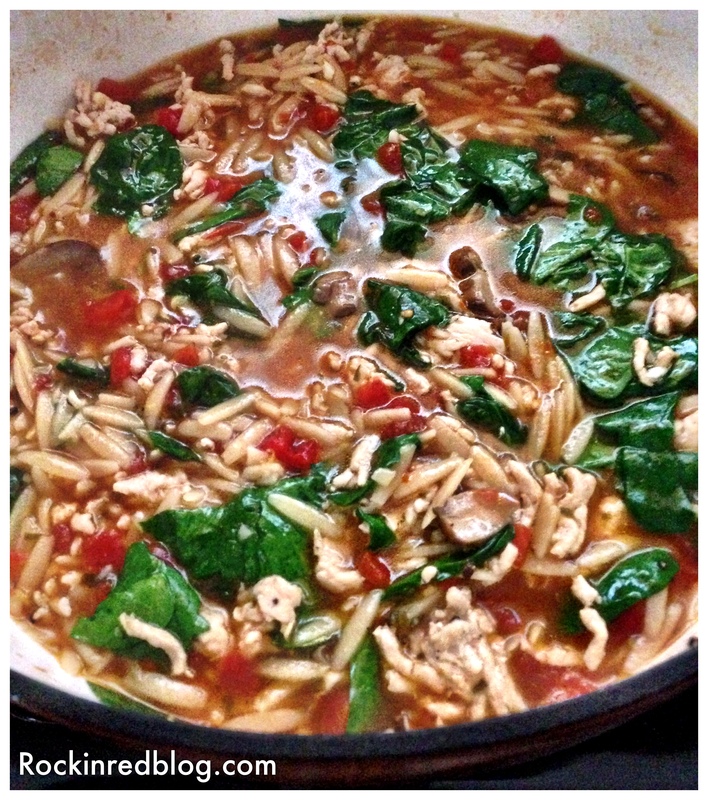 My husband loved all of it and asked me to please make the soup again. It was a delicious meal and wine pairing that I highly recommend. The Pinot Noir was quite versatile and would also pair well with pork, grilled steak and even lamb. You will recall from my article A Leap of Faith with Claiborne and Churchill that I am already a big fan of their wine! 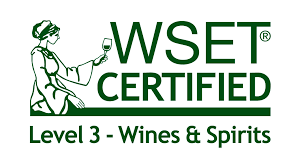 In that article I reviewed their 2013 Pinot Grigio, 2013 Dry Riesling and 2012 Pinot Noir; all beautifully crafted Alsatian and German style wines. 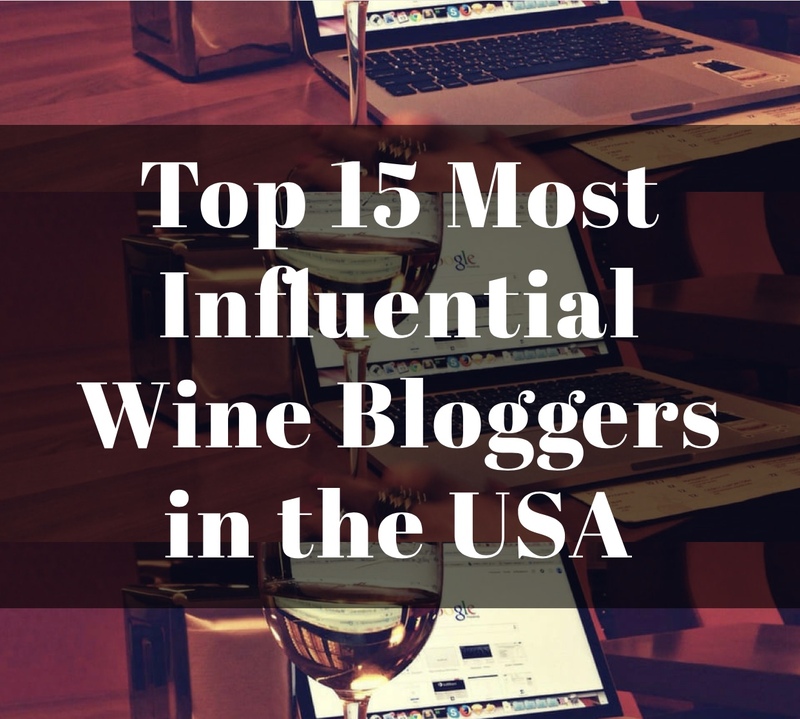 Therefore, I was thrilled to receive another wine from them; especially a Pinot Noir since I just returned from tasting a large variety of Pinot Noirs in Santa Barbara County. After enjoying the Twin Creek Pinot Noir, I continue to be impressed by the wines produced by Clay Thompson and Federicka Churchill. 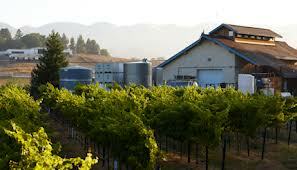 Claiborne & Churchill is a small, family owned and operated winery, founded in 1983 and located in the heart of the Edna Valley, just outside San Luis Obispo, California. Inspired by the wines of Alsace, we specialize in premium dry wines made from Riesling, Gewürztraminer, and Pinot Gris grapes, as well as handcrafted Pinot Noir from several nearby vineyards. We also produce small lots of other wines, including a Pinot Blanc, Dry Muscat, Chardonnay, Dry Rosé, Syrah, Malbec, and a Port-style wine. At Claiborne & Churchill traditional European winemaking techniques prevail, including extensive use of barrel-fermentation and barrel-aging (even with Riesling and Gewürztraminer), minimal manipulation of juice and wine, “natural” or spontaneous fermentation using indigenous yeast, and limited use of SO2, all in the belief that the winemaker’s task is to bring out the flavor and character that is latent in the grape. 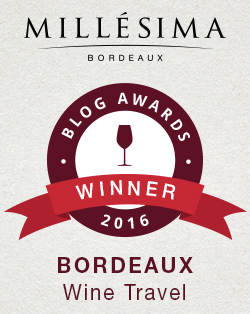 Our aim is to create pleasurable dinner wines in which there is a harmonious balance of fruit and oak, structure and texture. I encourage you to visit the Claiborne and Churchill web site to learn more about the winery, view their entire portfolio of wines and buy some for yourself. My Song Selection: The song I have chosen to pair with Claiborne and Churchill’s 2012 Twin Creeks Edna Valley Pinot Noir is Wine Night by Paul Brown and Marc Antoine, Midnight Mix by Jazzy Club. This up-tempo jazz song illustrates the upbeat harmony of the three clones blended and the elegant yet jazzy flavors they create in the Twin Creeks Pinot Noir. This song is a groovy collaboration between two smooth jazz artists to create a lively new song; just like the collaboration between the clones, vineyards and wine makers. So listen and enjoy a glass of C&C Twin Creeks 2012l Pinot Noir. 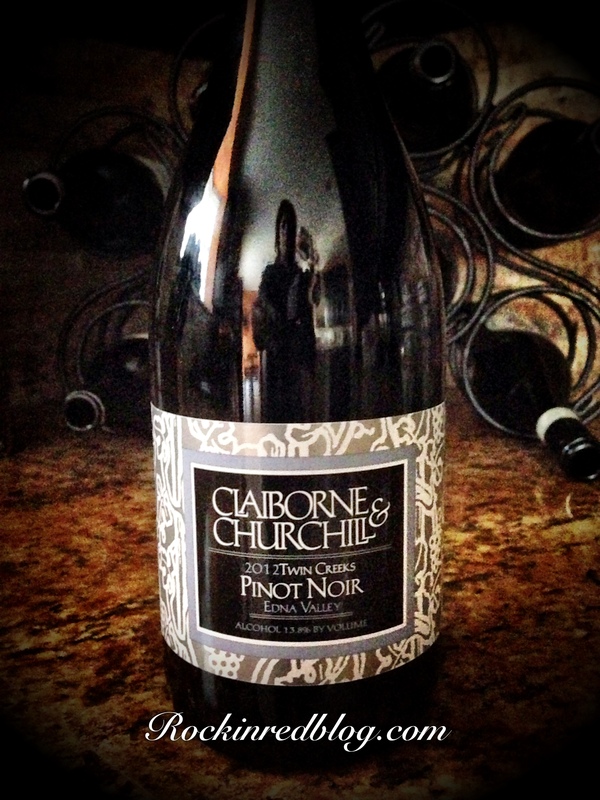 Get your own bottle of Claiborne and Churchill 2012 Twin Creeks Edna Valley Pinot Noir and let me know what song you would pair with it. Cheers! Delicious food and wine. Good choice to for the post dental surgical husband. The wine sounds really nice and I love wines from small winery’s. I will check them out and order from them. Thanks Suzanne. They are really producing very lovely wines at Claiborne and Churchill! That sounds really nice! I don’t see a lot of people advertising swiss wines or rootstock. I really like their pinot’s and their sparklers in Lavaux, all of them carry rose/raspberry notes that I’ve tried! I lived in Germany for close to four years and was lucky enough to stock up a few times on some gems from that region! You were lucky. German wines are hard to find around here; especially their Pinots. Thanks for reading and commenting! Cheers.